In the organization Chapter, much information has been collected from the secondary sources such as from annual report, different published articles, journals, brochures, web sites etc. Some information has been collected directly from organization. All the data collected for reporting purpose are systematically. Past and present information that are confidential could not be accurately obtained. Alike all other banking institutions, BRAC Bank is also very conservative and strict in providing managerial information. In such cases, we have relied upon certain assumptions, which are only amateur estimates. As many of the analysis on the obtained data are based on our sole interpretation, there may be some biases, as lack of knowledge and depth of understanding might have hindered our ability to produce an absolutely authentic and meaningful report. The gradual improvement in the overall policy environment has enabled Bangladesh to improve its economic performance in recent years. Successive governments in Bangladesh have been confronted with the problem of stimulating the economic growth rate in a country where a substantial segment of the population lives below the subsistence level. Economic policies are still guided by five year plans. Nevertheless, some progress has been made over the years, such as self -sufficiency in food grain production, reducing the population growth rate, poverty alleviation and boosting export income. The GDP growth has been about 6.5% in 2007, lower than 6.7% in 2006. The Banking Industry in Bangladesh is one characterized by strict regulations and monitoring from the central governing body, the Bangladesh Bank. The chief concern is that currently there are far too many banks for the market to sustain. As a result, the market will only accommodate only those banks that can transpire as the most competitive and profitable ones in the future. 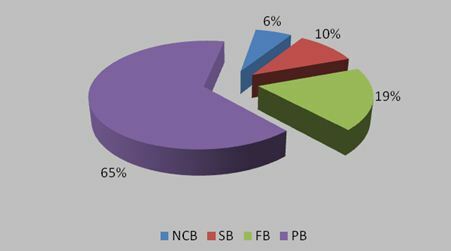 Of these, there are 3 nationalized commercial banks (NCB), 5 specialized banks (SB), 9 foreign banks (FB), 31 domestic private banks (PB) currently operating in Bangladesh. All local banks must maintain 5% Cash Reserve Rate (CRR), which is non-interest bearing and a 20% Statutory Liquidity Rate (SLR). With the liberalization of markets, competition among the banking products and financial services seems to be growing more intense each day. 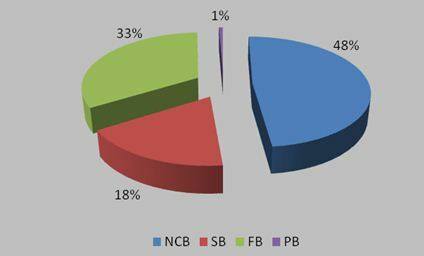 In addition, the banking products offered in Bangladesh are fairly homogeneous in nature due to the tight regulations imposed by the central bank. The Banking Industry of Bangladesh at present is in the growth stage. Almost every year new private banks are coming up, new branches are opening within two to three months, and new customers are coming to open an account in different banks. As a result, according to December 31, 2007 there are 3 nationalized commercial banks, 5 specialized banks, 31 local private commercial banks and 9 foreign commercial banks operating in this country. Market size of an industry can be measured by many ways, such as Total Revenue, Volume of production number of customers and so on. However, in case of the Banking sector the measurement of market size is quite peculiar as both the total amount of deposits and advances are taken into consideration. 1. Al-Arafa Islami Bank Ltd.
2. Arab Bangladesh Bank Ltd.
12. Islami Bank Bangladesh Ltd.
25. Social Investment Bank Ltd.
26. South East Bank Ltd.
28. The City Bank Ltd.
30. United Commercial Bank Ltd.
BRAC Bank Limited, with institutional shareholdings by BRAC, International Finance Corporation (IFC) and Shorecap International, has been the fastest growing Bank in 2004 and 2005. The Bank operates under a “double bottom line” agenda where profit and social responsibility go hand in hand as it strives towards a poverty-free, enlightened Bangladesh. A fully operational Commercial Bank, Brac Bank focuses on unexplored market in the SME business segment, which hitherto remained largely untapped within the country. The bank is also actively involved in retail banking and broad range of consumer loans ranging from to personal loan to auto loans to Debit & Credit cards. Furthermore the bank has gained a strong market share in the global money transfer market or remittance through significant tie-up with the most major transfer agencies. In the last five years of operation, the Bank has disbursed over BDT 1500 crore in loans to nearly 50,000 small and medium entrepreneurs. The management of the Bank believes that this sector of the economy can contribute the most to the rapid generation of employment in Bangladesh. Since inception in April 2008, the Bank’s footprint has grown to 36 branches, 392 SME unit offices and 67 ATM sites across the country, and the customer base has expanded to 200,000 deposit and 45,000 advance accounts through 2006. Today Brac Bank is considered as on of the fastest growing banks extending full range of banking by providing efficient, friendly and modern fully automated on-line service. Since its inception, it has introduced fully integrated online banking service to provide all kinds of banking facilities from its conveniently located branches. Corporate assets to be funded through self-liability mobilization. Growth in Assets through syndication and Investment in faster growing sectors. our strength emanates from our owner – BRAC. That means we will hold the following values and be guided by them as we do our jobs. Value the fact that we are a member of the BRAC Family. The number of directors in the board of the bank is 8 which are within the maximum limit as imposed by BRPD circular # 12 dated April 26, 2003 of Bangladesh Bank and notification – SEC/CMRRCD/2006-158/Admin/02-08 dated February 20, 2006 of Securities and Exchange Commission. Pursuant to the Bangladesh Bank’s BPRD Circular no. – 06 dated July 05, 2006 and in order to safeguard the interest of investors, depositors, creditors, shareholders we have completed credit rating by Credit Rating Agency of Bangladesh Limited (CRAB) for the year ended 31 December, 2007.
Credit Rating Agency of Bangladesh Limited assigned “AA2” (pronounced double A two) rating to Brac Bank Limited in the Long Term and “ST-2” rating in the Short Term. Commercial Banks rated in this category is adjudged to be very strong banks, Characterized by very good financials, healthy and sustainable franchises and a first rate-operating environment. Rating in this category is characterized with commendable position in terms of liquidity, internal fund generation access to alternative sources of fund. BRAC Bank Limited places the grater emphasis to maintain high standard of Corporate Governance. As the trustee on behalf of the shareholders of the company, the Bank’s board is fully aware of responsibilities and therefore, endeavors to safeguard the interest of all concerned. The Board of Directors is the highest level of authority in the organization structure of BRAC Bank Limited. The board is responsible for overall direction and is ultimately accountable to the shareholders for the activities, strategies and performance of the company. In terms of the Corporate Governance principles set out by the Securities and Exchange Commission our Board of Directors has appointed an Independent Director. The prime concern of the Board is to ensure that the overall activities of the business are conducted responsibly and with focus on long-terms value creation. The Board meets periodically to transact matters placed them that require Board’s approval and directions. Board reviews the overall business and where necessary strategic guidelines one givens for onward implementation. The Management Committee of BRAC Bank Limited is engaged to implement the decisions of Board of Directors and supervisions of day-to-day business affairs of the company. The committee is also responsible for achieving the business plan. The Committee consists of functional heads of different operating/business segments and is headed by Managing Director and CEO. In conformity with the Corporate Governance principles set out by the Securities and Exchange Commission, the Board of Directors constituted an Audit Committee. There are 36 Branches of BRAC Bank including the registered branch around in Bangladesh. In these, 12 branches are in Dhaka city and other 24 are outside Dhaka city. BRAC Bank has a strong and active management department. The department is divided in 19 divisions which have sub-divisions and many more features. Each of the divisions is now discussed briefly below. SME Banking division of Brac Bank Limited has ascertained with the specter to establish itself as the market leader in SME financing and to assist country’s economic development, serving different productive and contributing sectors in a focused way by mobilizing fund from urban to rural areas. In line with BRAC Bank’s vision, the SME Banking division’s objective is to achieve a two folded bottom line i.e. to build a profitable organization by contributing to the society as well as the economy through creation of an entrepreneur class in the society eventually eliminating poverty from the country. The deposit collected through the branches of BRAC Bank, which are mostly located in urban Bangladesh, are distributed nation wide to small & medium entrepreneurs through our dedicated SME unit offices located across the country. Lifting the country’s banking practices to a newer dimension, BBL has introduced a challenging platform wherefrom, it serves a customer base, which, previously was not acquainted with banking products & services along with the micro finance graduates who were in dilemma with regard to the access of credit towards enhancement of their business activities further. BRAC Bank Limited is the first bank to address the needs of “missing middle” in a focused way. BBL attempts not only to provide financial products and services to this segment but also help them to be educated & get aware, so that it can be easier for them to acclimatize themselves with the ever changing business world. BRAC Bank has brought a momentous change in the lifestyle of their clients and has significant economic and social contribution in poverty alleviation by upgrading the standard of living by generating employment. According to a research, BRAC Bank has contributed in generating more than 6,00,000 jobs over the last five years. SME Banking division has so far covered 113,00 customers mark and is fully dedicated to boost the customer base by reaching the doorsteps of small and medium enterprises involved in different business sectors and located in different parts in 64 districts of the country . Brac Bank has long been serving the fund requirements of traders, manufactures, importers, traders, suppliers and distributers, women entrepreneurs and other service providers like medical institution & educational institutions in a focused way. SME Banking division has also introduced a unique way of reaching the clients, spread throughout the country with 2000 efficient & dedicated people deployed in 392 unit offices. SME Banking division’s core competency is a combination of providing loans that are collateral free and offering a service that is quick, prompt and without any hassle. By doing this, the SME Banking division has helped to create a social revolution in the banking industry and also has served those who were not bankable to other banks. At present The SME Banking division of BRAC Bank Ltd. Offers collateral free loans up to BDT 10 Lacs or US$ 14,000. As of 2007, the SME loan portfolio stands at BDT 1,908 crore or US$ 272.57 million out of which approximately 95% is collateral free. SME Banking division is actively involved in providing facilities to the sectors that were mostly underserved by the banking sector and has enabled these borrowers to enjoy banking facilities instead of borrowing money from local moneylenders at extremely high rates. In 2007, BRAC Bank has excelled in SME Banking operation in almost the same volume that it has achieved from 2002 to 2006. The exceptional growth has been possible for continuous support of the stakeholders. Till 2006 the bank was a SME lender, but from 2007 onwards BRAC Bank Limited took a deliberate strategic approach to be the SME banker. Hence, The bank has participated in countrywide road shows and has entered into strategic alliance with national & international chamber bodies to build awareness and opted to provide with both deposit & loan products along with various other Banking services coupled with state of art & technology. Now that the Bank has expanded its businesses across the country, the need has arisen for a segment-oriented approach to SME Banking. The different niches within the same market need to be approached individually. Therefore, SME Banking division of BRAC Bank has well equipped itself with market focus units, with exclusive products & new strategies to serve varying banking requirement of the diverse Small & Medium Enterprises across the country specially the funding part. Women Entrepreneur Cell (WEC), one of its kinds in the banking industry of Bangladesh, was launched in 2006 under SME Banking division with an objective to offer access to formal finance along with training and technical assistance to the women entrepreneurs across the country. Women entrepreneurs were overlooked by the traditional banking sector, although they are sincere to repay, makes proper utilization of credit facilities and portray better repayment behavior as has already been proved in Micro Credit Programs. BRAC Bank is the pioneer to understand the need and credit requirement of this underserved sector, which has long been deprived of funding in a focused manner and thus instigated this business unit with “PROTHOMA RIN”, a customized loan product. In the small span of operation, WEC has already satisfied the financial need of 1,343 women entrepreneurs throughout the country. Women Entrepreneurs Cell (WEC) has excelled incredible in BRAC Bank is the pioneer in the banking industry of Bangladesh to conduct a need based training for women entrepreneurs through its Central Training Department as was committed by the WEC. In addition, WEC has organized training programs in collaboration with other trade bodies and institutions like Dhaka Chamber of Commerce and Industries (DCCI), Junior Chamber International Bangladesh (JCI) etc. As a nation matures from an under-developed to a developing country, the needs to satisfy its demand with available resources also increase. Thus a manufacturing sector develops gradually and the nation turns from a trading-based economy to a manufacturing-based economy. The Bank has identified Manufacturing Enterprises as a potential niche and launched the Manufacturing Business Unit in August 2007 under SME Banking division. The objective of launching this unit is to better serve the manufacturing sector by providing sector-focused loan & other services with regard to financial needs as well as addressing any other needs of this sector such as training facilities & advisory services. The Commercial Credit Unit (CCU) was launched in October2007 with the sole objective of providing financial services in the Trade Finance sector. As many existing clients of SME Banking are importers and have taken SME loans from the bank, the objective of CCU is to provide them with a one-stop banking service along with providing them with pre & post import facilities. All these products are part & parcel of a composite facility known as “Trade Plus”, a specially designed product for the import oriented business for import & incurring day to day expenses. The significance of linkage industry is inevitable for proper functioning of trading & manufacturing concerns. Linkage industry extensively contributes in manpower creation, economic development & financial acceleration. Creating a fresh financial market for this sub-sector is simply a diversification of the banking product. Due to this reason, BRAC Bank has moved into this area from September, 2007 as a part of new business development. Supplier & Distributer Finance unit was launched by introducing “Super Supply Loan”, a customized & composite facility of both overdraft & revolving limit for small & medium sized suppliers. BRAC Bank Limited proved its success in global SME financing sector by becoming one of the four most profitable and sustainable SME banks in the world, rated by Council of Microfinance Equity Funds (CMEF), USA following a global research. The other three renowned banks are Bank Rakyat Indonesia (BRI), Bank Compartamos (Mexico) and Equity Bank (Kenia). The success of SME Banking division extensively depends on the customer’s success in achieving goal with the required & timely assistance. SME Banking division is confident enough to continue it’s over increasing growth to take the bank ahead of its imagination and to erect newer and startling milestones in banking industry. “Retail Banking Unit” has further strengthened its position as a major channel of business by stretching its horizon with its unique offer of personal banking across the country. This unit takes foremost funding responsibility of the bank and is committed to offer multifarious services to entire customer base of the bank through Branch’s Alternative delivery channels, Premier banking services and literally Retail banking products to doorsteps through Direct Sales force. The year 2007 marked as a series of exciting events and achievements for retail banking unit. At the very onset, the year started with the challenge of establishing a new core banking software platform and Retail team played a very vital role to make the ‘FINACLE’ implementation a big success in all branch networks across the country. “Retail Distribution” unit takes care of all branch activities, this unit ensured a seamless operation in all b ranches throughout the year and also organized inauguration of 10 new Branch’s ; 2 in Dhaka, 1 in Chittagong and rest 7 in Barishal, Bogra, Dohar, Monohordi. Tongi, Potiya & Cox’s Bazar. Out of these 10 new branch’s 6 branch’s started operation in urban areas in different divisions / districts and 4 branch’s in different rural areas. This thoughtful placement of branch’s helped Retail Distribution team to offer a total banking solutions and services through its facilities to customers of these new regions. BRAC bank now has a total of 36 branch network in the country. Ensuring convenience for our valued customers always had been a priority to the management and in 2007, 3 major branch’s were relocated to convenient locations. These are Gulshan branch in Dhaka, Agrabad branch in Chittagong and Sylhet Milleneum branch in Sylhet. The new premises are quite spacious with extended facilities which ensure comfort to our valued clients. “Retail Distribution” also initiated evening banking facilities in three more branchs last year. Mirpur & Uttara in Dhaka and Moulovibazar in Sylhet. Response from respective neighborhood was observed to be overwhelming. “Medical Loan” was launched to arrange loans for people going abroad for treatment. Non Funded Business (NFB) unit under “Retail” concentrates on fee income for the bank. This unit runs a student centre where from all student files are processed for onward remittances for the purpose of studying abroad. This unit a MOU with VFS and IOM and through this agreement, all visa processing fees of a number of foreign embassies are being collected by this team in Dhaka, Chittagong and Sylhet. Its worth to be mentioned here that BRAC Bank is the only nominated bank in Bangladesh which may receive UK visa fees. “Premium Banking” unit ensures service excellence to highnetworth (HNW) customers of the bank through a team of dedicated Relationship Managers. This unit is committed to offer personalized services to HNW customers and arranges home delivery services at customer doorstep. Relationship Managers suggest appropriate investment opportunities to Premium customers and ensures a mutual benefit. Stop payment of cheque and ATM / Debit cards etc. Apart from the above-mentioned initiatives, service quality department is involved in solving customer complaints, customer queries and regular performance evaluation of front line employees through Score Card and Co-coordinating Mystery Shopping survey al the year round. Local Corporate Unit focuses on end-to-end services as per large corporate clients, mid-sized companies, and international trade finance businesses and institutional customers and government entitles / agencies demand. It offer a wide range of products and services, technologies to leverage them anytime, anywhere and the expertise to customize them to client-specific requirements. Our dedicated Team of Relationship Managers along with wholesale Operation unit, Extensive Line of Corresponding Banking Network support client’s local and international business by meeting Working Capital / Team Loan requirements as well as export and import financing. The bank emphasize on providing full-length services and products covering from suppliers to the ultimate consumers of our Corporate Clients. The Leasing and Institutions Unit furnishes financial solutions for all institutions and provides lease financing facilities for all corporate bodies. Its products offerings are suited to fast and timely availability of credit facilities to serve purposes of acquiring capital machineries, equipments and vehicles among others. Despite the apparent rigorousness of lease financing its product portfolio caters to customers funding for institutions. In view of the fact that not all of its target customer institutions are slowly aimed towards profit maximization but has significant impact on the development of the economy. Its target market segments including NGOs and other development organization, health service, industry, Non banking financial institutions, Micro finance institutions and educational institutions along with other corporate bodies that require support for building their business infrastructure. It believes in building long lasting relationship with its clients by collaborating in the journey to their growth and not just overseeing it. Medium Enterprise Unit serves medium enterprises having facility requirements alike large corporate in nature, but in smaller volumes. In order to reach specific market segments the unit has designed products like CommerZ loan, Supplier Finance, MFI Receivables Finance, Light Engineering Finance etc. Its clientele can be proprietorship concerns, private limited companies suppliers of corporate houses, chain super shops, educational institutions as well as NGOs. Facilities may include fund based like overdraft, short term loan, revolving loan, term loan, lease finance, LATR, bill discounting etc or non fund based like letter of credit (L/C) and letter of guarantee as well as composite credit facility that includes various corporate products. At present, Medium Enterprise Unit has a solid clientele base with a portfolio mix of about 100 crore funded facilities and 25 crore non-funded facilities. Cash Management & Corporate Liabilities unit under corporate Banking division provides corporate fund management solutions along with a number of investment opportunities to large corporate clients. It offer tailored cash management solutions like NCS (Nationwide Collection Solution), PTS (Payment Transfer Solution), Mobile Banking Services, Cash Pick Up Services and bill collection solutions through its own and correspondent branch network and through different alternative delivery channels as per clients requirement and specification. Within a very short span of time, its cash management unit has established themselves in the market by providing cash solution to large FMCGs, Telecommunications companies, NGOs and different Governmental Organizations. In addition to Cash Management solutions, its liability has also introduced different long and short run investment products for large and medium business enterprises. 2007 has been an eventful year for SRS. Remittance Services in 2007 has turned out to be one of the core business area of the bank. The year remained as a rewarding and successful one in terms of new tie-ups and partnerships with a focus on pursuing unexplored and niche markets around the globe. 4 new partnerships have been added to the list of SRS affiliated Exchange Companies in this year. Association with international renowned banks like ICICI bank and Bank of Ceylon are also major accomplishment of the year 2007. With a goal to provide fast and expeditious services to deliver remittances even in the most remote corner of Bangladesh, the network of electronically connected field officers have been expanded more than 1200 BDP outlets across the country for remittance payment. An array of products and services have been introduced targeting the non-resident Bangladeshis living in different parts of the world, a milestone for BRAC Bank as to becoming the pioneer in such operation. The official launching of Probashi Shubidah Account took place on 16 January, 2007 with a perspective to catering the beneficiaries of NRB customers with their different banking needs. SRS had also launched TT arrangements through Sonali Bank in Bangladesh, which has added to our options in making the fastest remittance in Bangladesh. In March 2007, an open-air concert was organized jointly by BRAC Bank and Western Union Money Transfer to endorse the remittance facility in Singapore. A road show was organized along with Western Union all over the country from the month of May 2007 to September 2007 as a promotional campaign to promote the newly added BRAC BDP locations as part of the wide coverage of BRAC Bank for processing Western Union transactions. This year, BRAC Bank has been also chosen as a western Union distribution network in Bangladesh. Secure remittance service of BRAC Bank, made strategic alliances with two other private banks – Dhaka bank on 13 may, 2007 and First Security bank on 17 September, 2007 as its subagents of processing Western Union transactions. SRS counter branding at the departure lounge of ZIA International Airport had been done this year. This unique branding had yield huge visibility at this key national installation and lifted the corporate image immensely. This branding at ZIA has been the biggest branding effort of BRAC Bank so far as it is estimated that annually 3 million (approx.) travelers are using ZIA International Airport for traveling. Overseas deployment of two employees from SRS team of BRAC Bank had been initiated in this year. One of them was deployed to Singapore on March, 2007 and other was to Italy on August, 2007 to promote BRAC Bank – Western Union remittance tie-up in the respective countries. Brac Bank had been considered as the market leader in terms of Western Union payouts with approximately 50,000 transactions in the month of December, 2007 among 13 agents and subagents in Bangladesh. This has honored BRAC Bank as one of the three largest WU agents in South Asia. In the end of the year2007, SRS participated in first ever NRB conference held in Bangladesh and was the main sponsor of the Painting Exhibition during the event. February 6th, 2007 marks the beginning of BRAC Bank’s Credit cards Business. Being the latest entrant into the cards market, the card division’s greatest challenge was to publish itself in an already demanding marketplace and create its own niche. In a space of a year, BRAC Bank today has become the fastest growing issuers of credit cards in Bangladesh. Staying true to our motto of being the bank of the masses it has successfully managed to penetrate and enlist a large segment of the middle class society who has adopted the plastic card as part of their everyday life. Dedicated and well defined organizational verticals allow efficient and quick turnaround of all internal and external challenges. Acquiring, Sales, portfolio, Product development, Customer Services and Collection wings forms an effective cards team to create a positive and lasting impact in the Credit Card market of Bangladesh. Treasury department is vested with the responsibility to measure and minimize the risk associated with bank’s liquidity, foreign exchange exposure and asset liability management. Treasury continuously monitors price movements of foreign exchange and uses various hedging techniques to manage its open position in such a way that minimizes risk and maximizes return. The Asset Liability Management (ALM) desk provides country economic analysis, balance sheet gaps, ALM ratios and many other findings before the ALCO. The Financial Institutions (FI) wings works as the trigger point of establishing new relationship with correspondent banks as well as to maintain the existing relationship to provide a smooth funding channel for all business units. Brac Bank’s treasury is well equipped with modern telecommunication infrastructure facilities like SWIFT, Reuters, Bloomberg, Internet, Voice Recorder etc. recently it successfully implemented Kastle, a treasury software which is one of the top ranked software for treasury functions from 3i InfoTech. Bank’s independent Dealing Room is committed to provide best rate / price to its customers. A centralized operation with on-line connectivity facilities its customer to avail fast and efficient service. BRAC Bank is a very active player in inter-bank call money and fx. market. It is one of the major suppliers of foreign currency in the inter-bank fx. market. Money market maintains the portfolio of Call & Term, Govt. & Private Securities, equity Investment, Repo & reverse Repo bank’s account while maintaining CRR & SLR. Fx. dealers quote very competitive cross currency spot, forward and swap rates to its customers while complying with Bangladesh Bank’s Foreign Exchange Risk Management Guidelines. BRAC Bank Has clearly demarcated Front Office, mid office and Back office having separate reporting lines, as per international best practice of treasury management and core risk management guidelines of Bangladesh Bank. The Front office involves in dealing activities, Mid office monitor rate appropriateness and any breach of limit while the Back office is responsible for all related process, support and settlement functions. BRAC Bank has a dedicated team for Asset Liability Management. Recently they implemented Kastle, ALM software from 3i InfoTech for their rigorous analysis and forecasting the market behavior and to provide useful information before the ALCO. The ALM team monitor and present before ALCO the country’s overall economic position, Bank’s Liquidity position, ALM ratios, Interest Rate Risk, Capital Adequacy, deposit Advance growth, Cost of deposit & Yield on Assets e.g. Gap, Market Interest Rate and deposit and lending pricing strategy. The ALM team is also responsible for complying all regulatory requirements related with asset liability management. BRAC Bank has a strong worldwide correspondent network with the world’s leading 20 banks to facilitate trade, remittance & other services to its client efficiently and profitably. BRAC Bank also maintains about 477 accounts with 13 local banks to support its Small & Medium Enterprise (SME), Probashi Banking Services (PBS) & Cash Management business throughout the country. Financial Administration Department Has the responsibility of doing financial planning and management, chart of A/C and control, budgeting, planning, cost management and ensures financial control across the bank. It also generates and disseminates all forms of internal and external financial reporting, regulatory reporting and all business MIS. General Infrastructure services (GIS) plays the pivotal role to ensure all kind of infrastructure support services for the bank. This department consists of six functional units namely Infrastructure Development, Infrastructure Management, Operations, procurement, Logistics and Small & Medium Enterprise administration Unit. With the combined roles and responsibilities of all these units, GIS is actually the execution point for all administrative related activities including the development of infrastructure setups for new Head Office Premises, Branch, ATM Booths, and Sales Center for BRAC Bank Limited all over the country. In order to minimize credit risk, BBL has formulated a comprehensive credit policy according to Bangladesh Bank Core Risk Management guidelines. 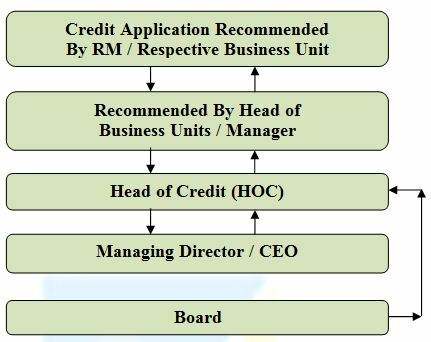 Credit policy of the bank provided for the separation of the credit approval function from business / marketing and loan administration function. Credit policy of BBL recommended thorough credit assessment and risk grading of all clients at the time of approval and portfolio review. Credit policy also provides thee guidelines of required information for credit assessments, marketing strategy, approval process, loan monitoring, early alert process, credit recovery, NPL account monitoring, NPL provisioning and write off policy etc. The board of directors reviews the credit policy of the bank annually. 1. Relationship Manager (RM) / Direct Sales Executives / Customer relationship Officer prepares the loan proposals and submits for recommendation from Head of Business Units / Respective managers. 2. Head of Business Units / Managers place it to credit division for their approval / recommendation. 3. After proper assessment of loan proposal by credit division, Managing Director Approves / recommends as per delegated authority by the board. 4. Managing Director presents the proposal before board. 5. Board advises the decision. Due to increase in business volume and for ease of operations, the bank has delegated approval Authority to individual underwriters (by name) within Credit Division for Retail, SME , Cards and Corporate Credit. 1. For smooth operations & reduction turn around time of approval process, the bank has initiated a web based (software) approval system parallel with its existing one. Through this approval system, BBL also wants to ensure the CRM guidelines on segregation of duties and responsibilities of business units from approval authority to maintain quality of portfolio. This will take over the existing paper based system immediately. 2. The bank has introduced a Central Verification Unit to support the verifications of data provided in the loan applications especially for Retail Credit & Credit Card. 3. Pre-approval visit by independent officer of Risk Management Department is mandatory for each proposal under SME unit. Approver only approves after receiving the visit report. This report has come into effect from the beginning of 2007 which verifies the authenticity of SME borrowers’ loan application individually. 1. Portfolio Review: In the time of portfolio review (2 times in a yr), factory / business visit & physical verification of stock should be conducted. Portfolio review should be conducted with updated information on the borrower’s financial & business conditions including review of – account performance, utilization of limit, financial stability, deviation from terms & conditions & security lapses, credit grading, CIB status etc. In the event of any deterioration the ratings are immediately revised as recommended by credit division. 2. Early Alert Report: Early alert process is an effective tool & technique that will help the bank in detecting any deterioration in clients account and trigger out problem accounts at early stage so that proper attention can be given to avoid any losses. 3. As part of monitoring, continuous monitoring of utilization of fund, timely repayment, monthly stock report verification, weekly reporting of status of cheque placement (cheque dishonored) of the clients, frequent client visits, visiting mortgaged properties at least once in a six-monthly period. 4. A robust technical support has been developed to monitor the Retail and SME credit to reduce the overdue by generating automated reminder litter. BBL also formed an MIS team to support monitoring by providing a vast MIS reports. 5. Review large exposures to a single client / group and portion of it being non-performing are conducted regularly. 6. Review sector-wise exposure, ensure portfolio diversification, identify sectors having high rate of NPL and provide special attention during the review. 7. Risk Management Department conducts audits of all credit files, security documents and provides an independent assessment of the quality of the asset portfolio. 8. Rating Review: As part of portfolio monitoring, review has been done on credit exposure on the basis of risk grade by credit division. Adequate trend and migration analysis also conducted to identify any deterioration in credit quality. Impaired Asset management (IAM) has been established to take care of Non-Performing Loans (NPL) of Corporate, SME & Retail with their approved policy guidelines, which deals legal matters & recovery process. Accounts Downgraded to 6 and above should be assigned to “Impaired Asset management (IAM)” for initiating legal action with recommendation from Credit Division and respective business unit and approved by Managing Director, who is responsible for coordinating and administrating the action plan / recovery of the account and should serve as the primary customer contact after the account the account is downgraded to substandard. However, to expedite the recovery, some NPL account of SME & retail have also been given to outsource agency in fully commissioned basis. Loan pricing on various lending categories will depend on the level of risk and type of security offered. During product pricing exercise, rate of interest is determined only after assessing the risk. The higher the risk, the higher the interest rate is. Interest rate may be reviewed at least once in 6 months and more often whenever is appropriate. Fixed interest rate should be discouraged. Generally interest rates vary with fluctuation of cost of funds based on a spread for profit. All pricing of loans however has relevance with the market condition and determined by Asset Liability Management Committee (ALCO) from time to time. However, for each corporate loan proposal, there should be a separate and unique pricing on the basis of risk grading and other relevant factors with proper justification. Consumer Service Delivery (CSD), an integral part of the bank’s business, complement the ever-flourishing retail business through account opening, customer statement generation, inter-banking cheque clearing, ATM & credit card production, cheque book production and processing government bonds. CSD continually aspire from retail business growth which saw the department expand significantly over 2007 in line with the growth attained by retail business in terms of personnel and activities. The year highlighted 8, 50,000 inter-bank clearing cheque processing, 1, 32,000 new account opening and more than 7, 16,000 account statement generation. In addition, CSD also produced 32,000 cards. There has been an overall expansion of 24% in the department in terms of activities than that of 2006. The new technology platform FINACLE introduced in 2007 has enabled centralized Consumer Service Delivery with on-line connectivity provide fast and efficient services. In its endeavor to facilitate business, the department initiated the processing and servicing of term-deposits as centralized function for all businesses that would support retail banking achieve its goal of breaking the barriers. To supplement the business target of 2008 and consolidate as fastest growing bank in the industry, CSD initiated the outsourcing of its major non-core functions such as data entry, cheque book personalizing & MICR coding and account statement generation. Keeping with the vision of the bank, CSD is entering the New Year by incorporating all retail operations and services including loan processing under a singular umbrella and announcing itself as Retail banking Operations. Enterprise Risk Management (ERM) is a new dimension for BRAC Bank Ltd. ERM will set risk management strategy across the enterprise, designed to identify potential events that may affect the organization and manage risk to be within its risk appetite to provide reasonable assurance regarding the achievement of organizational objectives. Head of Risk Management chairs the committee. The ERMC meet on 15th of every month. The committee discusses about the various issues raised relating to previous month and updates the same provided by units reported to Risk management department in the prescribed formats by 7th of the current month. The units qualify the specific risk according to the matrix provided by Bangladesh Bank. The meeting minutes are reviewed by the Board Audit Committee on quarterly basis. As corporate governance BRAC Bank Limited, the fastest growing bank in Bangladesh, is apprehended regarding risky areas, which are being identified by the Risk Management department. The Management under the guidance of the Board of Directors has developed an Enterprise Risk management Department separately to manage bank’s overall risk. BRAC Bank formed Asset Liability Management Committee (ALCO) headed by the Managing Director & CEO. All the business heads along with Head of ERM, Head of Credit & Head of Regulatory & Internal Control are member of this committee. The committee evaluates the economy and market situation, money market & fund position, capital adequacy, deposit-advance position, deposit mix of the bank, different ALM ratios, interest rate risk, foreign currency maturity gap, forecasted fund position, cost of deposits & yield on advances, deposit-lending pricing strategy etc. ALCO generally meets once in a month however, special ALCO meeting can be held if deemed necessary. Operating in a Banking industry BRAC Bank is exposed to many sectors of the economy. Since the very beginning the bank has adopted a policy to manage and mitigate its risk factors. BRAC Bank ahs adopted Core Risk Management guideline provided by the Bangladesh Bank as per BRPD Circular no. 17 of 7 October, 2003 and best practices in the global banking industry. In current centralized environment of operation, entire control mechanism of the bank wrapped around various departments and their sub wings. Thus the control mechanism in BRAC Bank is much stronger and reengineering the process faster than any other decentralized bank. The main objective of our Regulatory & Internal Control function to put the bank in a balanced position of Risk & Return, and no Risk should be unidentified and non-calculative. The objective of managing and mitigating risk factors derives the bank to adapt new ideas and technology. Recently the ban had moved to a new structure, where activities of managing risk are further broken down. Regulatory & Internal Control department has been restructured to focus more on regulatory issues and internal mechanism. Internal Control function ensures the bank manages its Internal Control & Compliance risk in accordance to the guidelines of Regulatory bodies and bank’s it self’s. These risks are defined as unexpected loss, consequential loss derived from human error, loop holes in the operational procedure, fraud and forgeries and technology failure. These risks are inherent in all activities of the bank. The Internal Control system of the bank enforces checks in all possible ways to minimize risk exposure towards internal factors. This system ensures all the departmental process and procedure are as per guideline provided and also maintains ethical standards, accounting rules. And efficiency in business process and safeguarding of assets are ensured. Internal Control & Compliance function consist of an audit and inspection process. The bank has placed audit procedure in its day to day activities. All departments and branches are audited periodically and instant recommendations are provided to concerned department and branch. These audit reports are submitted to the Board Audit Committee and Board of Directors. Moreover all our SME loans are audited prior disbursement. All SME loans are distributed on the conformity of the auditor upon verification of the validity of data provided in account and loan documentation. Money Laundering can be defined as breach of the regulation and being negligent in the prevention on money laundering. As per guidelines of Bangladesh Bank, Head of regulatory & Internal Control has been nominated as the Chief Anti Money Laundering Compliance Officer (CAMLCO); Branch Managers are as Branch Anti Money Laundering Compliance Officer (BAMLCO). BAMLCO’s throughout all its branches monitors all accounts and transactions with an established procedure of Know Your Customer (KYC), Transaction Profile (TP), Cash Transaction Report (CTR), Suspicious Transaction Report (ATR) and so on. KYC update process for its legacy accounts is in place. All branch personnel of the bank are trained on Prevention of Money Laundering procedure and process. In line with the objective the bank towards prevention of money laundering all the relevant departments are instructed to be vigilant and prevent such activities. The bank also conducts training programs and regular workshops for developing awareness regarding ANTI MONEY LAUNDERING. One of the significant developments in the corporate sector throughout the country is the Company Secretariat department of the company. Company Secretariat works as the bridge between policy and implementation. The duties of Company Secretariat are related with some legal, mandatory and ministerial responsibilities bound by the statue and managerial and administrative responsibilities. Company Secretariat is the flow line of all information to and from the Board of Directors. In the age of free economy, Company Secretariat maintains a clear and distinct relation and liaison among investor, financiers, bankers, donors. Correspondent and many others of the market economy. 1. Board Secretariat: Board Secretariat is the vital wing of Company Secretariat. One of the main tasks of the Board Secretariat is to convene, conduct and conclude meeting of the Directors and Shareholders. Company Secretariat of BRAC Bank Limited also maintains public relationship with specialized bodies like the Stock Exchange, Securities and Exchange Commission, Investment Corporation of Bangladesh, different banks, Register of Joint Stock Companies & Firm, Bangladesh bank etc. 2. Share Division: Share Division is directed under the Board Secretariat. The activities of Share Division are involved with Share Management of the BRAC Bank Limited. The Share Division maintains all statutory registers related shareholder. It also maintains relationship with the ordinary shareholders answers their quarries and assists them. Impaired Assets Management is a new concept in the banking arena. Impaired Assets Management (IAM) department of BBL is playing a pivotal role in managing Non Performing Loan (NPL) and Written Off Loan Portfolio of BRAC Bank and maintaining its Portfolio At Risk (PAR) at a low level. Basically IAM department takes legal steps against classified loan defaulters of the bank. IAM reduces NPLs through deploying third party recovery agencies and lawyers, amicable settlements with defaulters, arrangements for auctions of mortgaged properties etc. separate segments of IAM department are engaged to monitor and follow-up NPLs of different business unit. These legal and recovery processes are done under BRAC Bank IAM policy and Bangladesh Bank guidelines. For BRAC Bank, technology is the silent strength behind its wide array of products and its 24/7 service delivery capabilities. In 2007, BRAC Bank embraced a number of best-in-class technology platforms that will ensure seamless behind the scenes support for its rapid growth. BRAC Bank’s technology partners are some of the most renowned companies in the world. 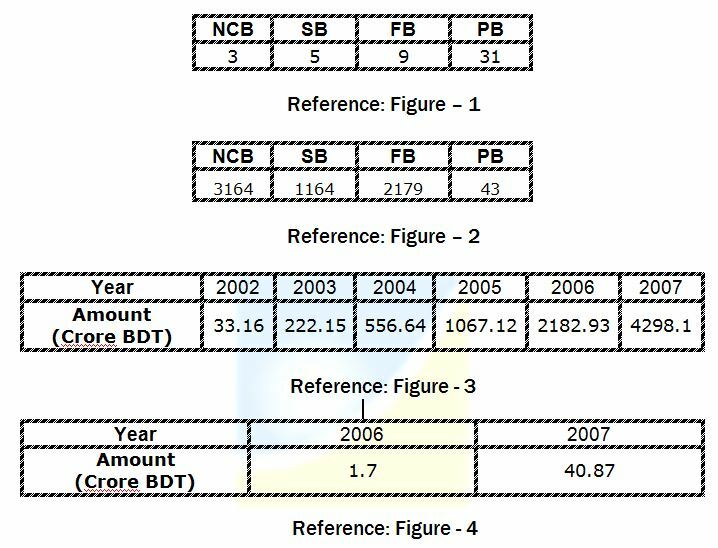 BARC Bank follows the guideline dated in BRPD Circular no. 14, dated 23 October 2005 regarding “Guideline on Information and Communication Technology for Scheduled Banks”. IT operation management covers the dynamics of technology operation management including change management, asset management and operating environment procedures management. The objectives are to achieve the highest levels of technology service quality by minimum operational risk. The Business Continuity Plan (BCP) is formulated to cover operational risks and taking into account the potential for wide area disasters, data center disasters and the recovery plan. The BCP takes into account the backup and recovery process. The BRAC Bank technology infrastructure now supports real time, online transactions between 36 branches for over 4,57,126 customers throughout Bangladesh. Steps are also underway to automate the 392 SME unit offices of the country to bring about further efficiencies and economies of scale. As it’s unique to truly broad-based and participatory electronic banking system in Bangladesh, BRAC Bank has sponsored OMNIBUS – a shared ATM network that covers 141 ATMs locations for customers of 15 banks. BRAC Bank’s Eldorado initiative, a proposed private sector nationwide remittance and payment system, was awarded a grant under the Remittances and Payments Challenge Fund (RPCF), an initiative jointly supported by Bangladesh Bank and the department. Project Strategy & Review Management (PSRM) is a new concept that deals with project administration and plays a pivotal role in coordinating and forecasting BRAC Bank driven projects. Assuring service quality as well as determining segment wise operational Risk exposure is another endeavors of this department generating Operational MIS to track and supervise operational as well as organizational growth also encircles the functions of PSRM. Human Resources Division plays a very important role in BRAC Bank. Managing almost 44oo employees is a challenging task and HRD is trying their best to do it in an efficient manner. Besides day-today operational works, HRD arranges two large recruitments each year for their Customer Relations Manager & Management Trainee Officer programs. Maintaining co-ordination among unit offices and branches all over Bangladesh is a big issue of HRD. HRD is trying to move towards automation for all HR processes. Two new models for E-Learning & E-Attendance have been introduced in the year 2007. Reward & Recognition Program, Employee Satisfaction Survey and other programs all around the year help to generate motivation and feedback from the employees. Marketing & Corporate Affairs takes care of all forms of marketing and corporate communication, brand management, promotional activities, public relations and CSR activities. Brac banc aims to be the most preferred brand in its category and the Marketing and Corporate Affairs department works towards realizing that ambition. BRAC bank is a socially responsible organization with an obligation to consider the interests of customers, employees, shareholders, communities and ecological considerations in all aspects of its operations. This obligation is seen to extend beyond its statutory obligation to comply with legislation. In line with vision of BRAC Bank, CSR is closely linked with the principles of sustainable development, which argues that it should make decisions based not only on financial factors such as profits or dividends, but also based on the immediate and long-term social and environmental consequences of its activities. As a part of its Corporate Social responsibility BRAC Bank donated $38,252 to ICDDR, B for the renovation of a temporary shed that was thronged with diarrhea patients soon after the recession of flood water of last year. A Co-Branded Credit Card was also introduced to maintain an ongoing support for ICDDR, B.
BRAC Bank has sponsored the 2nd National Women Entrepreneur Conference 2008, where women entrepreneurs from all over Bangladesh have participated to attend in the workshops and knowledge sharing activities undertaken by SME Foundation of Bangladesh. To assist Bangla Academy with their publication and research and development initiatives, BRAC bank has lent their support to carry forward their projects. Also BRAC bank has supported in stall preparation and beautification of ‘Amor Ekushey Boi Mela 2008’, this initiative was taken to make the fair enjoyable for participations as well as the visitors. To conserve nature and alleviate the illegal slay of immigrant birds, BRAC Bank has sponsored ‘Pakhi Mela 2008’ organized by Jahangirnagar University. Six new immigration counter of Zia International Airport is established for outgoing passengers by BRAC bank with proper branding and computer assistant to mitigate the time of passengers. A Probashi information counter has been installed for the wage earners who can gather information about sending foreign remittance to Bangladesh. BRAC bank took an initiative to stand by the SIDR affected people of Barishal & Khulna with relief. A number of employees distributed dry food, water, clothes, medicine etc. among the SME borrowers. A donation of TK. 1 million was made to an art exhibition of ‘Shako’ – a 12 women artist organization. The total money collected by selling the paintings was donated to ‘Apon Drug Rehabilitation Center’. To encourage and create awareness on SME development of Bangladesh, BRAC Bank has sponsored AMDIB forum organized by Institute of business Administration (IBA). This forum has helped the participants to share views, get key insight and discussed about the ways to alleviate problems faced by SME entrepreneurs, while seeking financial support. BRAC bank has also supported annual fund raising program of SAARC Women’s Association Dhaka to support and assist Islamia Eye Hospital and Dhaka Shishu Hospital for operation and treatment. To support the humanitarian endeavors of Rotary International like polio plus program, cancer detection unit, drug abuse and HIV/AIDS advocacy, Brac Bank has sponsored a conference organized by Rotary International. As a part of its corporate policy BRAC bank does not provide any financial support to any environmentally hazardous or child labor exploited company. The Audit Committee of BRAC bank Limited was formed by the Board of Directors of the Bank in associated with the BRPD Circular # 12 , dated December 23, 2002 of Bangladesh Bank and the notification of Securities & exchange Commission Notification No. – SEC/CMRRD/2006-158/ADMIN/02-08, dated February 20, 2006. The purpose of the audit committee is to ensure and to improve the adequacy of internal control system of the company’s operations and to assist the board in discharging its responsibilities towards the shareholders of the company. The decision making process of BRAC Bank is a long & complicated process. In order to make a decision, at first the top level of the department meet with the employees to take some primary decision. Then the top level of department sits with the head of the department to reform and finalize the decision. After finalize the departmental decision the head of the department inform the management committee about the decision. The management committee then discusses about the decision and gives their opinion. They can again modify the decision or forward the decision for approval of the Board of Directors. In AGM or EGM the Board of Directors discuss about the decision. If they feel that the decision that is taken by the department is necessary for the department and it will help the department to continuo its work smoothly the Board of Directors pass the decision in the meeting. Otherwise they reject the decision. By this process BRAC Bank takes every decision. In making decision the bank ensures the participation of all levels of the organization. As a result a tactful and well-timed decision is taken. But it has also criticism. The decision making process of the bank is time-consuming also. For this, the decision may not be useful for the bank. Besides this, for this process the related department can’t do anything for the decision. As a result the normal flow of the department is hampered. BRAC Bank is one of the leading banks in our country. It provides service with a strong management and strong team of employees. The bank is already at the top slot in terms of quality service to the customers and value addition for the shareholders. For its diversification in the management and participation of the employees in the management the bank is growing rapidly day by day. If it will continue, the bank will be one of the largest public banks within next 3 or 5 years.